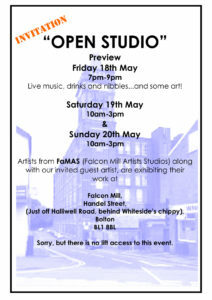 [description] => Bi-annual Open Studio exhibition featuring the artists from FaMAS (Falcon Mill Artists Studios) and an invited guest artist. [category_description] => Bi-annual Open Studio exhibition featuring the artists from FaMAS (Falcon Mill Artists Studios) and an invited guest artist. New work from the artists at FaMAS including three artists new to FaMAS will be on show at our biannual OPEN STUDIO event. Everyone is welcome from collectors and gallery owners to those just interested in seeing what creative efforts are being made in this part of Bolton. We will also be showing the work of our invited guest artist….details to follow! Come along and talk to the artists….we don’t bite….the only “biting” that is done is when Sarah or Pete are using nitric acid to bite into their etchings! The studios are located through the car park and towards the back of the mill up a large wooden staircase. Sadly there is not the usual lift access for this particular event. Anyone who is unable to negotiate the stairs should use the contact page on this website to arrange a private appointment during office hours when we can ensure the lift is operational. Alternatively, if you have the contact details of one of the artists at FaMAS then please make arrangements with them to visit.